New maps from orbiting sensors that can detect flashes of lightning even during the daytime reveal where on Earth the powerful bolts will most likely strike. Dec. 5, 2001: Lightning. It avoids the ocean, but likes Florida. It's attracted to the Himalayas and even more so to central Africa. And lightning almost never strikes the north or south poles. These are just a few of the things NASA scientists have learned using satellites to monitor worldwide lightning. "For the first time, we've been able to map the global distribution of lightning, noting its variation as a function of latitude, longitude and time of year," says Hugh Christian, project leader for the National Space Science and Technology Center's (NSSTC's) lightning team at NASA's Marshall Space Flight Center. Left: A lightning bolt strikes the Atlantic Ocean near Florida. According to a new NASA map of global lightning rates, such strikes over open ocean waters are rare. Image courtesy NOAA. This new perspective on lightning is possible thanks to two satellite-based detectors: the Optical Transient Detector (OTD) and the Lightning Imaging Sensor (LIS). "The OTD and the LIS are two optical sensors that we've flown in lower Earth orbit," says Christian, whose team developed the sensors. "The OTD was launched in 1995 and we got five good years out of it. The LIS was launched on the Tropical Rainfall Measuring Mission satellite in 1997 and it's still going strong." "Basically, these optical sensors use high-speed cameras to look for changes in the tops of clouds, changes your eyes can't see," he explains. By analyzing a narrow wavelength band around 777 nanometers -- which is in the near-infrared region of the spectrum -- they can spot brief lightning flashes even under daytime conditions. Before OTD and LIS, global lightning patterns were known only approximately. Ground-based lightning detectors employing radio-frequency sensors provide high-quality local measurements. But because such sensors have a limited range, oceans and low-population areas had been poorly sampled. The development of space-based optical detectors was a major advance, giving researchers their first complete picture of planet-wide lightning activity. Above: Data from space-based optical sensors reveal the uneven distribution of worldwide lightning strikes. Units: flashes/km2/yr. Image credit: NSSTC Lightning Team. The new maps show that Florida, for example, is one place where the rate of strikes is unusually high. Dennis Boccippio, an atmospheric scientist with the NSSTC lightning team, explains why: "Florida experiences two sea breezes: one from the east coast and one from the west coast." The "push" between these two breezes forces ground air upward and triggers thunderstorms. Within thunderclouds, turbulence spawned by updrafts causes tiny ice crystals and water droplets (called "hydrometeors") to bump around and collide. For reasons not fully understood, positive electric charge accumulates on smaller particles -- that is, on hydrometeors smaller than about 100 micrometers -- while negative charges grow on the larger ones. Winds and gravity separate the charged hydrometeors and produce an enormous electrical potential within the storm. "Lightning is one of the mechanisms to relax this build-up," says Boccippio. Another lightning hot spot is in the Himalayas where the extreme local topography forces the convergence of air masses from the Indian Ocean. And where does lightning strike most frequently? Central Africa. "There you get thunderstorms all year 'round," Christian says. "[It's a result of] weather patterns, air flow from the Atlantic Ocean, and enhancement by mountainous areas." The satellite data also track patterns of lightning intensity over time. In the northern hemisphere, for example, most lightning happens during the summer months. But in equatorial regions, lightning appears more often during the fall and spring. This seasonal variation contributes to a curious north-south asymmetry: Lightning ignites many of North America's late-summer wildfires, while some studies find that wildfires in South America are sparked more often by humans. Why the difference? It's simply because lightning in South America happens during a season when the ground is damp. Summertime lightning bolts in North America strike when the ground is dry and littered with fuel for fires. Meanwhile, areas such as the Arctic and Antarctic have very few thunderstorms and, therefore, almost no lightning at all. 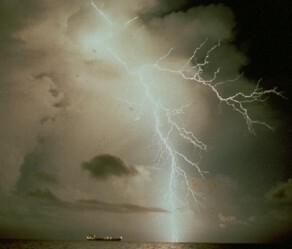 "Oceanic areas also experience [a dearth of lightning]," Christian says. "People living on some of the islands in the Pacific don't describe much lightning in their language." 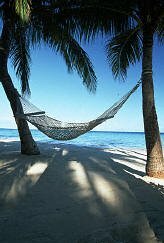 The ocean surface doesn't warm up as much as land does during the day because of water's higher heat capacity. Heating of low-lying air is crucial for storm formation, so the oceans don't experience as many thunderstorms. Left: Relax. Lightning rarely strikes Pacific Islands. According to Boccippio these global patterns probably aren't much influenced by human activity. Some people have suggested that buildings and metal communications towers increase the overall frequency of lightning strikes. But, "lightning that does make it to the ground is pretty much creating its own channels," Boccippio says. "The likelihood that we are changing the amount of cloud-to-ground strikes with construction of towers is very slim." He cautions, however, that this has not been verified experimentally. To answer such questions, a new lightning detector -- the Lightning Mapper Sensor or "LMS" -- is on the drawing board at the NSSTC. The proposed instrument would circle our planet in a geostationary orbit over the United States, detecting all forms of lightning with a high spatial resolution and detection efficiency. Right: The Lightning Imaging Sensor (LIS) on board TRMM monitors lightning flashes on the Earth below by collecting 500 images per second. The same optical technology will likely be found in future space-based lightning sensors. Image courtesy NSSTC. The LMS or something like it could provide valuable -- even life-saving -- data to weather forecasters. "The same updrafts that drive severe weather often cause a spike in the lightning rate [at the onset of] a storm," explains Boccippio. So, measuring the rate of lightning flashes in real time might offer a way to identify potentially deadly storms before they become deadly. Clearly, lightning research is a field truly crackling with potential. You can learn more about it from the Global Hydrology and Climate Center's web site: Lightning and Atmospheric Electricity. National Space Science and Technology Center -- a research and education initiative consisting of researchers and resources from government, academia, and industry. The NSSTC focuses on Earth Science, Space Science, Materials Science, Biotechnology, Advanced Optics Technology, Space Propulsion Physics, and Information Technology. Global Hydrology and Climate Center -- an NSSTC partner. Observing Lightning from Space -- (NSSTC) Lightning strikes the ground, so why observe it from space? Find out by visiting this web site. Learning from Lightning -- (Science@NASA) Little by little, lightning sensors in space are revealing the inner workings of severe storms. Scientists hope to use the technique to improve forecasts of deadly weather. The Tropical Rainfall Measuring Mission -- a joint mission between NASA and the National Space Development Agency (NASDA) of Japan.